A simple recipe to try with the kids over the weekend. Low carb muffins in just 30 minutes! No flour, no butter, sugar substitute and a whole lot of taste. 1.) Preheat the oven to 180 degrees. Line a muffin pan with paper liners. 3.) Whisk the egg white with a pinch of salt. 4.) Mix yolks, yoghurt, lemon juice and rapeseed oil until creamy. 5.) Add the xylitol sugar and continue stirring. 6.) Mix the baking powder with the ground almonds and lift under the batter. 7.) Lastly, add the egg yolk. 8.) Immediately scoop the batter into each muffin cup. 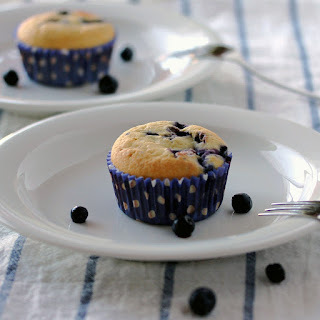 If desired, decorate with blueberries and chocolate chips. 9.) Bake the muffins in the pre-heated oven on the middle rail for about 20 minutes. 10.) Let cool and serve.